1. Specification: (1) Impedance: 50 ohms. (2) Frequency range: 0 to 12.4 ghz. (3) Working voltage rg178 = 170 vrms at sea level max. Rg58=335 vrms at sea level max.rg174, 188, 316 = 250 vrms at sea level max. (4) Insulation resistance: 5000 megohms min. (5) Dielectric withstanding voltage rg178 = 500 volts rms min. Rg58 = 1000 volts rms min. (6) Rg174, 188, 316 = 750 volts rms min. (7) Contact resistance center contact: 3.0 milliohms max. (8) Outer contact: 2.0 milliohms max. 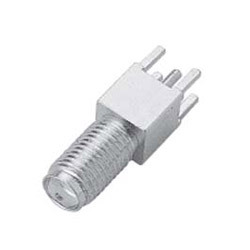 (9) Vswr straight connector: rg178 = 1.20 + 0.025f. (f in ghz). (10) Rg174, 188, 316= 1.15 + 0.02f. (f in ghz). (11) Rg58 = 1.15 + 0.01f. (f in ghz). (12) R/a connector: rg178= 1.20 + 0.03f. (f in ghz). (13) Rg174, 188, 316= 1.15 + 0.03f. (f in ghz). (14) Rg58= 1.15 + 0.02f. (f in ghz). 2. Mechanical specification: (1) Force to engage the torque required to engage and disengage shall not exceed 2 inch-lbs. (2) Coupling nut retention force 60 pounds min (for plug connectors only). (3) Coupling proof torque 15 inch-pounds min. (4) Connector durability 500 matings. (5) Cable retention force rg178 = 7.3 lbs min. (6) Rg316 = 12.1 lbs min. (7) Rg58 = 28.7 lbs min. 3. Environmental specification: (1) Corrosion (sail spray) mil-sid-202f, method 101d, condition b. (2) Thermal shock mil-std-202f, method 1017g, condition a. (3) Vibration mil-std-202f, method 204d, condition b. (4) Mechanical shock mil-std-202f, method 213b, condition a.